Today we chat with Ian Thompson, 54, a lifelong Chelsea supporter originally from the UK but now residing in Canada. 1) What is your earliest memory of being a home fan? Best memory is when my Uncle Stewart – who was a devout Chelsea fan when he was young (my grandfather and his father grew up near Stamford Bridge and raced greyhounds around the track in the 50 and 60s!) – took me to see Chelsea Vs Man Utd @ Stamford Bridge to watch Bobby Charlton’s last game in 1973 when I was 10 years old! We stood in the Shed and the ground was a shadow of what it is now!! 2) What is your earliest memory of being an away fan? My grandfather Cecil (who played for West Ham before he enlisted to fight in the first world war) used to love Brighton and Hove Albion and he took me as a young kid to a Brighton vs Portsmouth game at the Goldstone Ground. At that time I had no idea about how these clubs were not too keen on each other! We stood in the Brighton terrace end and it was more than interesting. Pompey won I believe! 3) What is your most memorable terrace moment? In 1978 I went to Stamford Bridge with my friend Dave Whately to watch Chelsea beat Liverpool in the FA Cup. Chelsea were a 2nd division side and Liverpool were winning everything. Fasher Walker, Kenny Daglish, Peter Bonettio, commentator Brian Moore and The Big Match! Those were the good ole days! 4) What is your most memorable game? 5) What is your favourite ground? 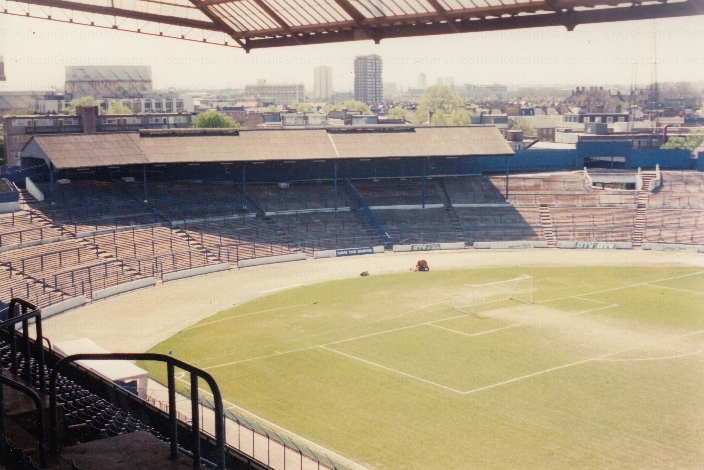 It has to be the old Stamford Bridge ground. The old Shed End, especially with the running track where my grandfather used to run his greyhounds back in the day! Great history and great ground! 6) What is your best football memory? Has to be when Brazil played England in Mexico in the World Cup with Gordon Banks making one of the most amazing saves I have ever witnessed against you know who: Pele! And watching the Brazil team throughout that 70s World Cup! This Chelsea Liverpool cup game also is up there! 7) What is the best ground you’ve visited? 8) Which club has the best fans you’ve encountered? Best fans have to be Newcastle… They’re patient and starved of success. They also have amazing loyalty and St James Park is always full! 9) Who was your favourite player growing up? I loved watching Jarzinho from Brazil. He was smooth, quick, and great to watch playing in the Mexico World Cup! 10) Would you bring back terracing? Absolutely. Best memories for games and great atmosphere! It’s just a shame about the hooliganism that eventually brought in all seated stadiums. Chelsea Liverpool cup game just the best – fabulous. Also thrilling to watch Chelsea beat Middlesboro. Thanks. You made my evening. Like what you see? Prints, pillows, iPhone cases and more are available for your club! Millwall and The Den | Legendary Football Grounds on Shop now! © 2019 Legendary Football Grounds.